Mapuguaquén means “the sound of the earth” in Mapudungun, the language of the indigenous aborigines from the south of Chile. Mapuguaquén speakers are made from clay on a potter’s wheel, finished with terra sigillata, and rounded with other natural materials such as olive wood and cork. The speakers were conceptualized using traditional techniques of craftsmanship and regional resources to fulfil contemporary needs. Furthermore, this unconventional method of fabrication allows us to rethink pottery as well as speakers while preserving the environment. The speakers recently won the Green Product Award, 2015 in Germany, category newcomer consumer electronics Green Award Product 2015. To create these tile, Recycled China has developed a new process of infusing various discarded materials with recycled aluminum. When these two materials meet, the molten aluminum flows and curls around the aggregate material and cools immediately, capturing this rapid moment. These one-of-a-kind surfaces are designed to engage the viewer: From a distance the tile are modern and sleek, while with a closer view they reveal a fascinating depth of texture. Each material option is lightweight and can be produced at a range of sizes to fit any interior and exterior space. Having been invited to participate as a jury member at the International Ceramics " CICA 2015" , to the city of L’Alcora, I took the opportunity to visit this Spanish town. For years I had dreamed of knowing more about this place so I went on my own on a days trip . The view of a large industrial production centre for the Ceramic tiles can be seen from the hills before reaching the town itself. All establishments of the most important Spanish producers are located here . This industrial area, the main subject of the whole view seems to take siege of L'Alcora which is situated on a hill. Along the drive that takes you to the inhabited town is the artificial lake of the Queen Maria Cristina which is so full of water in this period that the tips the many willows that grow along the banks submerge in it. Faces of ceramic. Why this title? Since a long time ago I wanted to write an article on the ceramists, their background and how they work. While I was visiting a fair I got the idea of photographing their faces and expressions, hence the title "Faces of ceramic." 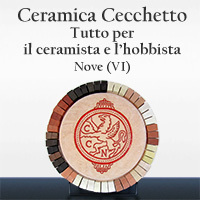 Why has the ceramic industry had such a great development in our Province of Vicenza and in particular Nove and Bassano? It all dates back to 1728 when the Venetian Senate gave tax breaks to those who would be able to present products of high quality ceramics to compete with the booming Chinese porcelain and Dutch majolica. The inspiration came from the image of a lonely guy eating noodle at a restaurant, with chopsticks on one hand, and cell phone on the other. He could be prescribed as IDS (Iphone Detachment Syndrome), but for some people, that is absolutely the most normal thing to do – stay connected to the world. A phone gives a purpose to the user, and brings the lonely guy to an undisturbed, secured bubble. MisoSoupDesign sees the problem of needing a third hand while eating. The design is to “restore” the proper table manner while eating ramen (of course, in a very sarcastic way). Now, you have both hands free to use chopsticks and a spoon. The double layered ceramic bowl can keep the hot soup nice and warm, and it won’t be too hot to hold. Researchers in the UK and around the world are currently working on prototype technologies that could enable new types of aircraft to travel at hypersonic speeds - five times faster than the speed of sound. At these speeds, planes would have enough power to leave the Earth's atmosphere and fly through space, before re-entering to arrive at their destination, which could dramatically cut travel times. One of the current challenges of making hypersonic travel a reality is developing a material that can shield these planes from the extreme temperatures of over 2000°C caused by their re-entry into the atmosphere. Ultra High Temperature Ceramics (UHTCs) are a group of materials that can withstand the extreme temperatures above 3000°C, making them suitable for use in hypersonic travel. Their strong chemical bonds make them exceptionally durable and useful in erosive, corrosive and high temperature environments. Researchers at the Centre for Advanced Structural Ceramics at Imperial College London are carrying out world leading research into structural ceramics in a range of areas, including materials that could be used in the aerospace industry. Rebirth Ceramics' birds give spaces a touch of happiness and carefree, thanks to a masterfully molding that take care of each single detail and thanks also to the contemporary decoration obtained through the use of mat colours. Freeijis project is a cooling system which uses no electricity. This system is adapted from an “evaporative cooling” process melded with advanced “PCM” smart materials to create a new, innovative cooling system that improves the quality and length of refrigeration without using electrical power. Nests in ceramics and pottery, these nests are attached to walls or hung from trees, are very useful to give a chance? to many species of birds that would otherwise be difficult to nest in our gardens. Some nests are placed on the ground and used for animals such as hedgehogs that in the absence of layers of dry leaves and shrubs found in these shelters their ideal place to spend the winter. These ceramic eggs have the look, feel and approximately the same weight of real eggs. They come three ways; all brown, all white, and all pastel multi. (Sorry,no mixing boxes) These eggs will help entice your hens to lay in the nest, not on the floor. Or use for home decoration. Shipped 1 dozen to a pack.